Settling in to write a story about robots, I couldnt resist using this Styx lyric for a heading. But I paid for it in spades when I then couldnt get "Mr. Roboto", the fatuous, if harmless song, out of my head for the rest of the time I spent on this piece (a curse worse than writers block). The song does, afterall, begin with a synthesized voice singing lyrics in Japanese. Then theres the reference to labor performing robots "with parts made in Japan". And lest you forget (and those of you who recall the tune I KNOW are hearing it now yourselves), theres this following profundity: "The problem's plain to see: too much technology/ Machines to save our lives. Machines dehumanize". Imagine having to deal with THAT incessantly reverberating around the insides of your skull while youre trying to concentrate and get some work done. It was my editor that did this to me. Allow me to explain. Before recently entering the California gubernatorial recall election, celebrity Arnold Schwarzeneggar was already in the news for another famous endeavor of his, namely, his ongoing role as the automaton assassin Terminator". During those more innocent days (pre-"The Running Mans entry into the Total Recall days, the "End of Days" days), my editor Sam North was curious as to why T3 has been doing so well in Japan. More importantly, he wanted to know whether its box office success could in any way be related to the fact that the Japanese themselves seem to have a special affinity for robots, a propensity for developing them, and as I might throw in, a high comfort level for co-existing with technology. Furthermore, he wondered if there is something in the Japanese makeup that predisposes them so? Being asked such was a forehead-slapping, "Why didnt I think of this?" moment for me. Because these questions get to the heart of the image of Japanese society. Something on which Id like to think of myself as being conversant. The following is how Id answer such questions. To begin with, indeed, the Japanese are on the cutting edge when it comes to both developing and putting to use robotics. In 1999, the U.S.s Robotic Industries Association estimated that Japan had in use approximately 300,000 robots, while the United States trailed in second place with 52,000. The industry which employs the greatest amount of robots is the automotive industry. *1 (So now you know who or what- has been putting together all those flawless Civics and Sentras that stream down the worlds roads.) A Japanese engineer I know who designs high-end connectors used in everything from memory modules for digital cell phones to CPUs in computer servers, spoke with me about the dominance of Japanese robotics on factory floors around the world. In his field he sees manufacturing leaders -be it Seimens of Germany, Phillips of the Netherlands, or rising-star Samsung of South Korea- all turn to Japanese makers when it comes time to supply their factory lines with robotics. FANUC of Kyoto, is the most famous robotics maker. In a joint venture with GE of the U.S., they lead in America too. And mentioning other major players of the robotics industry sounds like a roll call of the Japanese Chamber of Commerce: Epson, Kawasaki, Panasonics Panasert, Sanyo, Seiko, Sony, Yamaha, and a host of smaller Japanese firms that are prominent, if not famous. But how is it that Japanese people are at the forefront of designing, and living with robots? The answer to this comes in two parts. The first has to do with a society mobilized by command economics. And the second, with a little boy who was born on April 7, 2003. But before we get to that, its relevant to note that minds with more gravitas than Dennis DeYoungs of Styx have conjured up visions of future dystopias with robots displacing humans. In celluloid, Fritz Lang gave us HEL (Metropolis), Stanley Kubrick and Arthur C. Clarke gave us HAL, and while not exactly a robot, who can forget Woody Allens Orgasmatron (Sleeper). From Henry David Thoreau, who probably would have given a thumbs down to turning over our lives to robots, to Theodore Kaczynski who did, and set off bombs to prove it, westerners have been ambivalent at best about "too much technology". Yet the Japanese seem by and large to be uninhibited in their march to a highly mechanized, technological society. Why? I sat down with another friend of mine who happens to be a professor of marketing at the prestigious Waseda University. While robotics is not his forte, understanding Japanese society and what makes it tick is right up his alley. I asked him to what degree did Japans role as a major exporter of automobiles and electronics over the last half century have anything to do with the forming of Japanese attitudes towards technology. Quite a bit, was his reply. Unlike major American and European multinationals that often serve as whipping boys for environmentals, anti-globalists, conspiracists, and other such fun-seeking groups, in Japan companies such as Toyota or Sony enjoy the "image of positive, sophisticated companies", in his words, that "benefit the economy and the people" of the nation. Though recent economic stagnation and Japanese corporate scandal have just begun to dim popular perception, the exalted social position given to the corporation in Japan remains firm. The most common model for a company is that of a giant family taking in the worker as a new member, and of an equal and conscientious partner with government in shaping and guiding society. Though predating World War II, this reality particularly waxed in post-war period. The Japanese powers-that-be determined that the country would rebuild and pursue prosperity by having a nation of workers manufacture goods to be exported to the American and western European markets. All forces were marshalled towards that goal. Government regulations, the tax codes, and entire government ministries were developed, all towards the purpose of supporting industry. Emphasis was put on education at the primary level by a rigid Ministry of Education that determined what was to be taught in every classroom, in every corner of the country, even down to what text book page each student throughout the country would be turned to on any given day. Channeling of most students into vocational secondary programs was instituted and to this day a four-year college education is a luxury for only about 10% of the population. In fact, 25% of Japanese youths leave school after junior high school. At all schools though, mathematics and basic science was and mostly still is vigorously taught. All of this was part of the master plan to develop a technically competent workforce for the factories. An expensive and laborious car inspection system induces the Japanese car buying public to replace existing cars with brand-new models every three years. This, along with trade barriers, handed automobile manufacturers here the home base of a captive domestic market with an artificially high turnover. Meanwhile, southeast Asia and far eastern Russia are full of second-hand Japanese cars and trucks bought on the cheap in a Japan due to a glut of three year-old and over models sitting in used car lots throughout the nation. Im hardly breaking any new ground by showing an image of Japanese post-war society with the corporation at its center. But continuing with that view, it also follows that the means to the various Japanese corporate ends technology should be highly exalted in Japan as well. From turning out transistor radios in the early days, to the recent LCD flat panels found on your cell phone, Japan accumulated wealth and comfort over the last 50 years largely due to its enthusiastic, if top-down ordained, embrace of high technology. And what better embodies technology, futuristic technology, then robots? Or, as my friend the marketing professor pointed out to me, a comic book character, a little robot boy by the name of Tetsuwan Atom (or as readers of the English language version know it, Atom Boy) is probably more responsible than anything else for the Japanese affection for robots. And there have been many other robot characters cutely doing good deeds in Japan. The robot-cat from outer space, Doraemon, may perhaps be the second most famous. Now, this may sound silly, trying to attribute Japans fascination and success with robots to comic book heros. But especially with Atom Boy, the importance can not be underestimated. 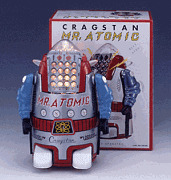 ..Atom Boy was a cartoon that several generations of Japanese grew up with and is cited by many of today's robot engineers as the spark that ignited their interest in the field. "My parents had been a fan of his cartoons so when I was a little kid I used to read their comic books all the time," said Tomotake Takahashi, who was at Robodex to display his latest robot, Neon, which he says was inspired by Atom Boy. "After reading the books I felt like I would like to become an inventor of robots." So now you have it. Domo arigato, Mr. Roboto. And for me, sayonara Dennis DeYoung. Youre being purged from my brain. Never to be rebooted again. And now Im going to go put on some vintage Santana, some Steely Dan, and just maybe even a little "Radio Ga Ga" by Queen.